I heard the news today that Robert "Strängen" Dahlqvist of the Hellacopters passed away at the young age of 40 recently. Totally bummer news. At the height of their powers I say they were one of the greatest rock n roll bands ever. They called it quits back in 2008 but I still listen to their records all the time. Such a great band. They didn't make it over to the USA very often so I count myself lucky that I was able to catch them live twice while they were still rawking! I've been meaning to post this for awhile. This was the first time I caught The Hellacopters live. What a better place then the intimate confines of the old Starlight in Ft Collins Colorado. I believe that they played in Denver the night before and then hit Ft Collins on Saturday night. With the Nomads and the freakin Quadrajets!!! Holy hell what a night of Rock N Roll. At the beginning of 'Bore Me' Nicke Andersson dedicates it to American food. At the end of the song and before 'City Slang' Nicke says he didn't want to offend anyone and mentions that they love Waffle House. Robert chimes in "they have crazy teeth and bad service". Pretty funny. 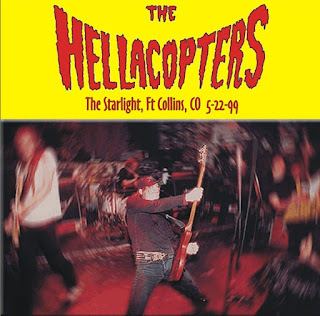 Anyway here is a rad sounding board recording of The Hellacopters tearing it up that night in Ft Collins. 11 (Gotta Get Some Action) NOW!